You are currently browsing the tag archive for the ‘tobin tax’ tag. Financial markets are treacherous. I’m not saying this because I’ve lost a lot of money to them recently- oh wait, we all have! – but because they’re pathologically antisocial yet somehow exotically enticing. They’re the new femmes fatales. No matter how many times we wine and dine them, and how many times we pay for it, they’ll keep us hooked. The financial markets have been jittery with speculation about Greece defaulting on its debts- unsurprisingly, really, if we consider that Greece has the highest gross government debt as a percentage of GDP in Europe- somewhere around 125%. And, many ask, if Greece does default, what will happen to other countries with high debts, such as Spain and Portugal? Will they survive the same financial attacks – if interest rates rise the deficit effectively increases because of rising interest on the bonds – or will they show more ‘fiscal responsibility’. In other words, a ‘credible’ response to tackle the Greek government’s debts does not mean cutting money from health, education, technology and the environment to pay back bond holders – it means instead that lenders understand that investment in these sectors will secure their repayment over the long run. The economic cases for more regulation and a ‘Robin Hood’ tax are also strong. But, I suppose, the markets are worried. And we’re still hooked. The governments of Europe and America bailed out the financial sector and stimulated the economy. The deficits now need repaying, and it’s becoming clearer who’s going to pick up the tab. Our message to the banks is clear: “don’t worry, we’ll get that”. Because, honestly, we really will get that, and we really, really don’t want you to worry about it. As you’ve probably already seen, today saw the launch of a major campaign to introduce a Robin Hood tax on financial transactions by a host of organisations working on issues of global and domestic poverty, international economic reform and social justice. Bill Nighy and Richard Curtis have produced a great little film explaining the tax’s merits and appropriateness and nef is just one of the organisations backing this campaign. The Robin Hood tax would impose a very small fee for every financial transaction between financial institutions. That means it is not a tax on the financial services you or I would use. It is intended to make those who brought our economy to its knees, massive multi-national financial institutions, pay for the $20,000,000,000,000 (that’s twenty trillion dollars or a third of global GDP) of bailouts, guarantees and quantitative easing they have benefitted from. Here in the UK we’ve spent more than $ 1 trillion (£635 billion) to bail out our banking sector. Very conservative estimates suggest it could raise £100 billion for domestic and international issues, helping to limit how far we have to cut public services in the UK and ensuring that we meet our commitments to the developing world to alleviate poverty. At a rate of just 0.05% per transaction, and given the huge sums taxpayers have stumped up, it seems a no-brainer in terms of being an appropriate and feasible policy option. Today sees the start of a campaign to introduce a tax on financial transactions in the banking sector that would raise billions to save vital public services, green the economy and tackle poverty. Called The Robin Hood Tax, the campaign bears the same name as a report nef wrote back in 2001 with our colleagues at War on Want, which outlined why a transaction tax – sometimes called a Tobin Tax – would stabilise volatile markets and raise funds for international development. The Green New Deal Group also recommended a Tobin Tax in their latest report, The Cuts Won’t Work. Even at a rate as low as 0.05 per cent on each transaction has the possibility to raise hundreds of billions each year. And when the banks have been saved at the taxpayer’s expense, it’s only right that we should see some return from it. And surely even the most self-assured banker – even one played by Bill Nighy – couldn’t be opposed to that. nef is very proud to be part of the broad coalition of NGOs who are calling for this tax. You can show your support by signing your name on the Robin Hood Tax website. 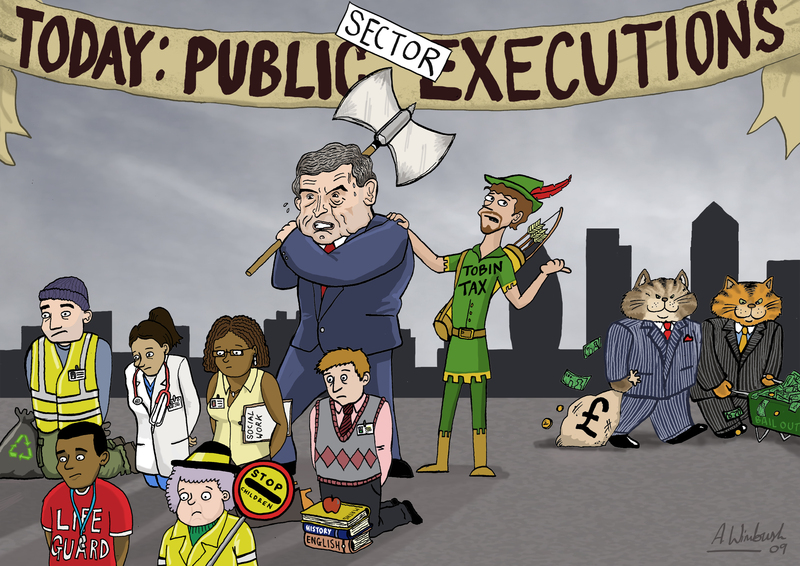 The Tobin Tax is back in the headlines again, with Gordon Brown now insisting that support for a levy on financial transactions is growing. I’ve also noticed that our friends at the World Development Movement are starting to campaign in this area. nef made a case for the Tobin Tax way back in 2001, with our report Robin Hood Tax. All of which gives me license to reprint a cartoon I published in the last edition nef‘s newspaper, Radical Economics. Enjoy! Large parts of the City have grown too big and need to be cut down to size, if necessary by imposing new taxes, according to the chairman of the Financial Services Authority. Lord Turner of Ecchinswell, an influential figure in the reform of banking rules in London and beyond, said that the City had grown “beyond a socially reasonable size”, accounting for too much of national output and sucking in too many of Britain’s brightest graduates. “I think some of it is socially useless activity,” he said, adding that the financial sector had “swollen beyond its socially useful size” and seemed to make excessively large profits. Lord Turner named fixed-income securities, trading, derivatives and hedging as areas that have grown beyond socially optimal levels, adding that fund management and share trading might also have grown too big. Lord Turner added that he would favour City-specific taxes if his proposed new rules on capital failed to shrink investment bank balance sheets and curb the more useless or reckless trading. “If increased capital requirements are insufficient, I am happy to consider tax on financial transactions, Tobin taxes,” he told a discussion organised by Prospect magazine. nef has been long been proposing that regulators curb the power of the financial sector with taxes, and using the revenue generated to finance more socially beneficial schemes. Back in 2001, when the current recession was just a glint in the speculator’s eye, we wrote a report with War on Want in which we proposed a “Robin Hood Tax” or Tobin Tax to divert funds away from the global currency market into funds for peace and international development. When the report was released, nef Policy Director Andrew Simms argued that a tax of this kind would be “an automatic and politically painless way to help pay for international targets on sustainable development”. Today, when the voting public are still furious about continued bonuses and profiteering in the City, the tax would not only be politically painless, but politically therapeutic. And there are even more uses for the money raised: it could be used to power a Green New Deal, create an adaptation fund for poor countries who are feeling the effects of climate change, kickstart a Post Office Bank which would help small businesses and financially excluded communities… the list could go on. We’ve also repeatedly said that the banks need cutting down to what Turner calls a “socially reasonable size”. Our post-crunch reports From the Ashes of the Crash and I.O.U.K. both propose de-merging the biggest banks, and separating speculative trading from the retail, high-street banking that all of us rely on. Lord Turner has a perfect right to start stirring up discussion about how to shrink a wholesale financial sector that has, he says, “swollen beyond its socially useful size”… Let the debate begin.